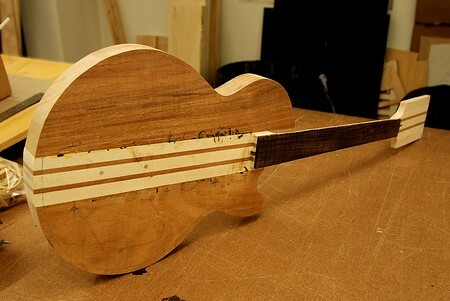 Wouldn’t it be great to build your very own guitar? Have you ever thought about building yourself a Mexican Stratocaster guitar? It takes patience and work but it is certainly a rewarding effort. Here is how. Read on. The installation of this pick guard is easy. Take the tremolo ground wire and put it in the left side hole. Put black and white output wires to the jack area. Screw the pick guard onto the body and don’t over tighten it. Install the strap buttons. Use the two black and white wires you ran to the jack area ( you may choose either side), solder them onto the jack. Protective eyewear should be used. Standard Mexican Fender Stratocaster parts include a bridge with saddles, 6 screws for the bridge, tremolo claw with 2 screws, and a whammy bar. Screw the spring claw into the body slightly and solder the tremolo ground wire onto the spring claw. Secure the tremolo block to the guitar body on the reverse side. Leave 1/8 inch of play in these screws and the 2 point tremolo system. Use pliers to stretch the springs into correct position. Tighten the screws on the spring claw leaving play in the block. Place the tremolo cover on the body. Be careful when stretching the strings. If you lose your grip, the string my fly off and damage the surface of the guitar. Take every safety precaution you can. Protect your face and eyes with protective eye wear as well. Standard Mexican Tuners or Deluxe Tuners will also work on this neck. Use a wrench to install and tighten tuners. Do not over tighten. You don’t want to make this difficult on yourself to remove if you have to in the future. Next install the neck plate. Allow the screws to protrude no more than 1/4 inch. This will assist in aligning things up when you install the neck on the guitar. Put your neck onto the screws. Rotate all the screws to tighten them. Do not force the screws to go into the guitar with one motion. It destroys the wood. Make sure the screws go completely down without causing any damage. If you need to use a piece of cardboard to ensure your intonation is correct then do so. Install two strings. You should install a fat and thin E string. This will ensure that if the neck has to be removed to shim it again. You will not have to remove all the strings to adjust the guitar. Now, take a few moments to carefully tune your guitar. Enjoy playing your brand new guitar.